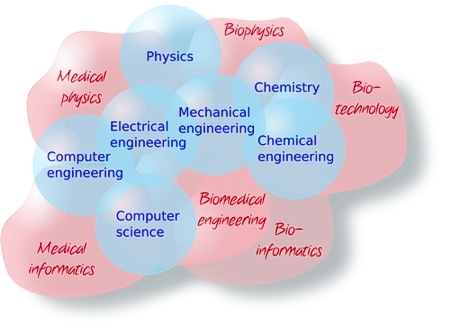 Biomedical engineering is a very broad, interdisciplinary field that involves the application of engineering, the physical sciences and computer science to medicine and the life sciences. We are the first Biomedical Engineering Department in Canada, and uphold a tradition of leadership and excellence. The department was established in 1989, but its history can be traced back to over 40 years. We can look back on major accomplishments, such as the invention of the artificial cell, development of novel brain imaging technologies, novel encapsulation of cells for drug delivery, models for physiological systems, and novel development in areas such as nanomedicine, lab-on-a-chip or magnetoencephalography. Whereas most Biomedical Engineering departments are in Engineering, we are proud to be part of the Faculty of Medicine at McGill, which is the #1 in Canada. The close integration with medicine ensures that our research is closely aligned with clinical needs and will improve patient care. Our department is one of the most dynamic within the Faculty and has one of the largest graduate programs. The department hosts a wide range of unique research facilities, and maintains close collaborations with clinicians and researchers for an array of disciplines both locally and around the world. In 2016 our graduate program evolved to become the Biological and Biomedical Engineering (BBME) program, an interfaculty studies program run jointly with the Faculty of Engineering. In 2017 we offered a new graduate certificate in translational biomedical engineering. To obtain more information on our department please visit our contact page.